The two Skan Group Holdings engineering manufacturing businesses, Boughton Engineering and Oldbury UK, last night won the prestigious Greater Birmingham Chambers of Commerce ‘Excellence in Manufacturing’ award. 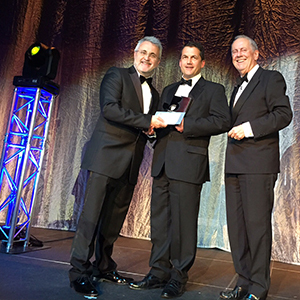 At a packed 1300 guest show-biz scale event at Birmingham’s ICC, Group Managing Director Richard Skan, was presented with the award by Paul Kehoe, President of Birmingham Chamber of Commerce and event host, Gyles Brandreth. Speaking immediately after the presentation, Richard Skan said, “We are naturally delighted to have been shortlisted as a finalist against some of the best companies in the Birmingham and West Midlands area and then to have won the award itself. It is a tribute to the success of our businesses, but particularly to our outstanding people, both within the management team and across the companies. “For Boughton Engineering particularly, this marks a watershed moment of its return to a market leadership position in the waste handling equipment sector, following its acquisition by my family just over five years ago. We have made significant changes to the business, with the introduction of new and updated products and we are now in a strong position to move forward towards a planned and successful long-term future”. Boughton Engineering and Oldbury UK share co-located headquarters in Wolverhampton, supported by a modern fabrication facility in North Devon. Its customer base includes major fleet and hire companies, as well as smaller operators and its defence sector products are supplied to military users both in the UK and elsewhere. The GBCC award criteria involved a detailed examination of the business covering manufacturing processes, structural organisation, output and financial performance as well as human resources, aftermarket & service support and customer satisfaction. Richard Skan summarises, “There are three crucial elements to our business – time, money and people. Time is a given, money is digits, but it is people who define success or failure. People are the most important asset in our business”.